You have a blog based on news review, hot news, updates, tutorials, etc. Well most pengunjug of the niche comes from mobile users or mobile phones. Can not be denied, now everyone has their own cell phone gemgam. Almost everyone is never separated from electronic devices this one, because it can be said has become the lifestyle of each individual. In addition, today's mobile phones have incredible sophistication called smart phones that can support your daily activities. So, it's time you make traffic / blog visitors coming from mobile devices as a source of dollars that you can use. Opportunity promised mobike device is quite tempting to try, because the rapid growth of smartphones now.  Well here I want to share advertising tips for the best mobile device from mobicow. What is mobicow? Please refer to the full explanation below. 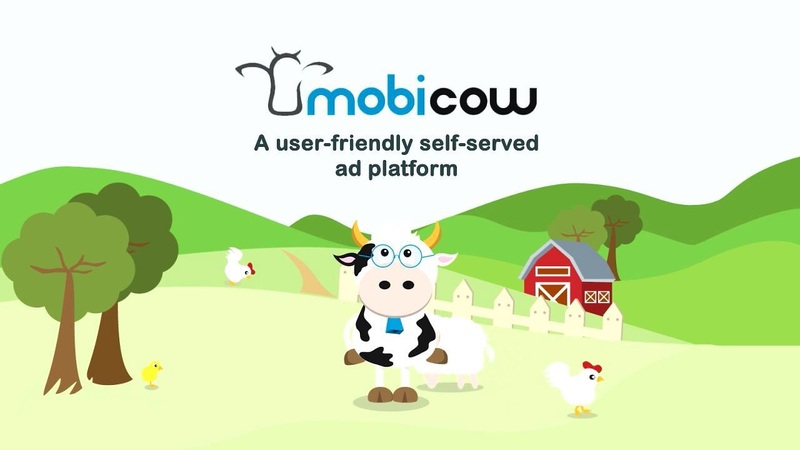 Mobicow is one of the providers of ads specifically for blog users who are sourced from mobile devices (mobile phones). 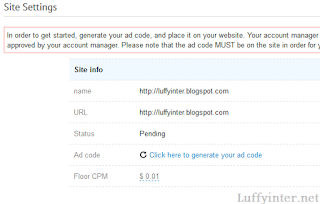 Mobicow also did not hesitate to hesitate to pay expensive to the bloggers who include ads from mobicow on their blog. The mobicow advertising program calculates publisher revenue per thousand ad impressions, or so-called CPM. Mobicow also promises a fairly high CPM value, so the dollar will flow continuously for your blog. The type of ad used mobicow is a popunder ad, as you already know, popunder ads are ads that will appear when website visitors click anywhere on the part of our website. Usually this popunder ad appears behind (new tab) from the website page visitors first see. Opportunities from pop ads are very promising for all bloggers to try, because pop ads work by themselves without requiring you to click on paid. The registration process is very easy and short. In the process of registering blog site kemobicow enough to wait approximately 12 hours after that you will directly in Approved. Receive all blogs with Indonesian and other foreign languages. Powerful Pop Up ads, good enough also make CPM higher. And not too disturbing visitors because it is directly created in the New tab. Mobicow ads can be installed alongside other cpm ads like Popads, Poptm, or Popcash. It needs to be underlined that mobies of popunder ads will only appear to visitors using mobile devices. So for visitors who access your blog using a PC, laptop, notebook, will not be counted in this impression ad serving mobicow. How to register a mobicow can be spelled out very easy, you just need to fill in some registration columns that exist during the registration process. You need to know, before you start register make sure you have some items below. If you already have the four items above, now you can now register to become a publisher of CPM based advertising program from mobicow. To shorten the time, please note step by step how to register the latest mobicow below. 2. Then click the start now button found on the homepage mobicow. 3. After that will appear registration registration page, on the page there are 3 steps that you must pass. Well here's how pengisisan step per stepnya. Campany name >> Fill in your company name * Can be filled with your site name, for example: "Learning Business Online"
Note: Username and Password will be used when you login to mobicow dashboard, so make sure you remember both items especially password. * If you are forgetful, please note the username and password. 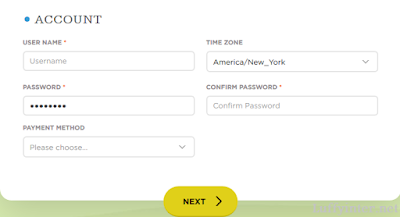 If all the registration columns have been filled in correctly, then please click the next button to continue to the next step. 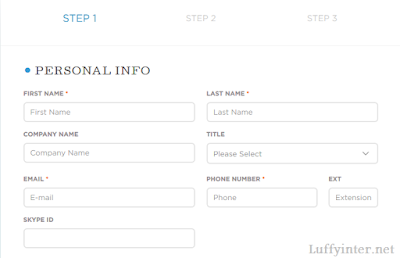 If all the fields are filled correctly, please click the next button to continue to the last step. 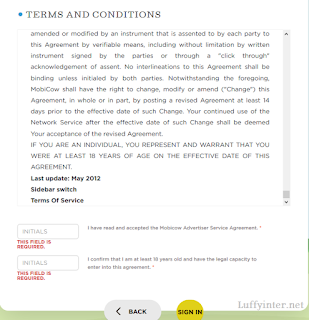 On this page there are terms of service (TOS) of mobicow, please drag down until you meet two columns. If both columns are already filled, please click the sign in button. 4. After you hit the sign in button, the notification will appear as shown below. 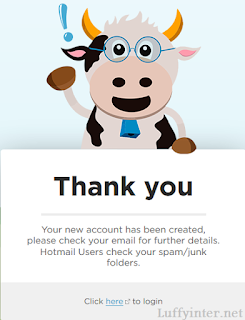 * The notice contains about your mobicow account has been successfully created, then please check your email inbox to confirm ownership of mobicow account. 5. Please search for a message sent by mobicow in your email, following example email sent by mobicow. 6. After that you will enter login depth, please you login using username and also password that you have daftarkam before. Well until the sixth step you have successfully signed up on the mobicow advertising program, or in other words you have become one of the publisher mobicow. Now the next step you should do is to install the script code ad mobicow to your website. Next, how to install ad mobicow to your website, by placing an advertisement from mobicow this is one way for website that you register fast accepted (approved). As long as the website you registered has not been received, then the ad code that you have installed on the website will not work or will not display ads until the website you register is accepted by mobicow. 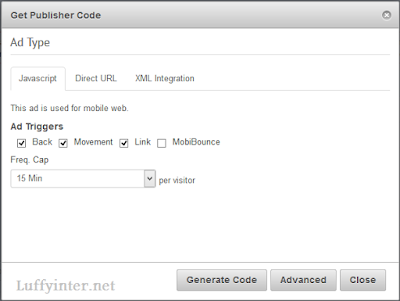 Here's how to retrieve mobicow ad code, to install on the website (your blog site). 3. On your site page , please click on the "pencil and key" icon in the options column. 4. After that will enter the site settings, then please click on the phrase "Click here to generate your ad code" to get the script script ads. If you've met, paste the code t ad mobicow ads just above the tag </ head>, and finally click save template changes. Well until this stage you have selsai masang ad mobicow, now you just need to wait website that you register accepted (acceptance) by party mobicow. If your website has been approved, then your popic mobicow ads are ready to be posted on the website. If it is so, then you just have to wait the dollar coffers into your mobicow balance. If at any time you want to add a new website on mobicow, then you can do the following steps. 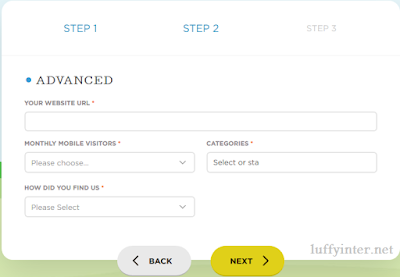 Site url >> Fill with your website url * use "http: //" and "www" if using TLD. 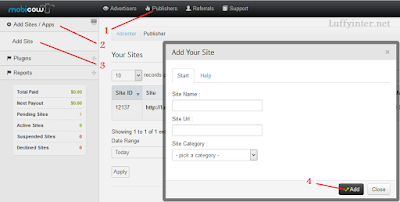 Site category >> Choose with the category of your website content. Note: Choose a category that matches the content of your blog actually, because the ads that appear will match the categories of the blog itself. The worst impact that occurs if you enter your category of blogging is your blog will be suspended by the Mobicow. Now you can add new sites easily and quickly into the mobicow, then just install the script code ad mobicow in order to be approved quickly. Well after your balance accumulated, you are on a payout or payment request from mobicow. Payments are made net30 on every 15th for one payout. There is also a method of payment can malalui paypal account and payza, the minimum payout of both payment is $ 5. Maybe that's all I can say in this post about the review of mobicow ads called sabagai best mobile advertising network is on the internet. Hopefully with this post can be useful and useful for you all. If in the article above there is a less clear sentence, please let you can comment on the comment field on this blog site.